Seahorse Etched Coffee Mug Glass Set is the perfect ice tea or coffee glass at 13 oz when entertaining at your coastal home. 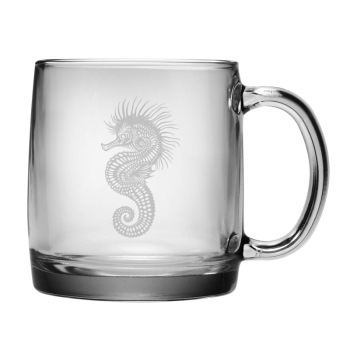 Impress your guest with this designer set of Seahorse drink ware. Hand decorated by skilled artisans at Susquehanna Glass in the Amish Homelands of South Central Pennsylvania.Built upon pride in craftsmanship and quality,this family owned business has been productive in America for one hundred years. Of all the coffee cocktails the Irish Coffee is the most popular. This drink only dates back to the 1940's. The Irish Coffee served in this style of glass mug was recreated in San Francisco and today is our classic wintertime drink.